Individuals from the Council on American-Islamic Relations (CAIR) visited the White House at least 20 times starting in 2009. In 2008, CAIR was listed as an unindicted co-conspirator in the largest terrorist money laundering case in U.S. history  the trial of the Holy Land Foundation in which five HLF officials were convicted of funneling money to Hamas. U.S. District Court Judge Jorge Solis later ruled that, "The Government has produced ample evidence to establish the association" of CAIR to Hamas, upholding their designations as unindicted co-conspirators. In 2008, the FBI formally ended all contact with CAIR because of its ties to Hamas. In January 2004, Hussam Ayloush, executive director of CAIR's Los Angeles office, publicly defended Palestinian terror attacks in comments before Muslim students at the University of California  Los Angeles, saying that terrorists were exercising their "legitimate right" to defend themselves against Israeli occupation. Ayloush, who was a delegate to the 2012 Democratic National Convention in Charlotte, N.C., casts the United States as controlled by Israeli interests. At a 2008 CAIR banquet in San Diego, he imagined "an America that respects and humanizes religion. It's an America that is free to act on its values and not on the interests of any foreign lobby." In 2004, he said that the war on terror had become a "war on Muslims." Ayloush attended at least two White House meetings. According to reliable sources, Monteiro was White House liaison for secret contacts with CAIR, especially with Ayloush. IPT has learned that the White House logs curiously have omitted Ayloush's three meetings with two other senior White House officials. Louay Safi, formerly executive director of the Islamic Society of North America, visited the White House twice  meeting in intimate settings with Paul Monteiro on June 29, 2011 and July 8, 2011. Law enforcement first noticed Safi in 1995 when his voice was captured in an FBI wiretap of now-convicted Palestinian Islamic Jihad leader Sami Al-Arian. At the time of his conversation with Al-Arian, Safi served as executive director of the International Institute of Islamic Thought, an organization listed in law-enforcement and in internal Muslim Brotherhood documents as one of the movement's top front groups in North America. Safi has repeatedly expressed understanding for the underlying causes that provoke terrorism: "Terrorism cannot be fought by...ignoring its root causes. The first step...is to examine the conditions that give rise to the anger, frustration, and desperation that fuel all terrorist acts." He also called Palestinian terrorists "freedom" fighters. According to video captured by IPT, Omeish went a step further at the December 22, 2000, Jerusalem Day rally in Washington's Lafayette Park, praising Palestinian terror groups, saying they had learned "the jihad way" to "liberate" Palestine. In a sermon at Dar al-Hijrah in 2009, Omeish called for "an American Islamic movement that transforms our status, that impacts our society, and that brings forth the change that we want to see." 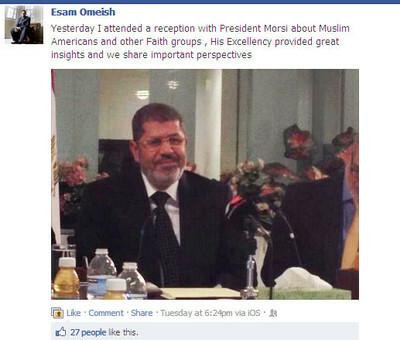 Last month, Omeish attended a reception for Egyptian President Mohamed Morsi during Morsi's United Nations visit. Morsi is a longtime Egyptian Brotherhood leader. Omeish posted a picture of the event on his Facebook page and noted: "His Excellency provided great insights and we share important perspectives." Mohamed Elibiary, appointed to the Homeland Security Advisory Council in October 2010, spoke at a December 2004 seminar in honor of Iran's Ayatollah Ruhollah Khomeini, titled: "A Tribute to the Great Islamic Visionary." Elibiary condemned the convictions of the defendants in the Hamas money-laundering trial as a "loss for America" and dismissed the prosecution as "a political trial trying to achieve a government policy." He also opposed the targeting of American-born al-Qaida cleric Anwar al-Awlaki, saying it wouldn't be "worth the ramifications of having to chase his ghost as a martyr for the next half century." Interestingly, the Obama administration's enthusiastic support for gay rights did not prevent it from inviting Islamists who support laws overseas giving gays the death penalty. In a June 21, 2001 article in The San Francisco Chronicle, Muzammil Siddiqi, the former head of Islamic Society of North America, said he "supported laws in countries where homosexuality is punishable by death." Siddiqi met with Monteiro on June 8, 2010. The Muslim Public Affairs Council (MPAC) has secured the closest working relationship with the Obama White House despite a record of anti-Semitism, whitewashing the terrorist threat and hostility toward law enforcement. Fifteen MPAC officials have been welcomed by the White House. Executive Director Salam al-Marayati enjoyed at least six White House visits between September 2009 and July 2011, mostly involving meetings with Monteiro. Alejandro Beutel, who was MPAC's government liaison until July 2012, had 10 White House visits between July 2010 and May 2012. Edina Lekovic, an MPAC spokeswoman, visited the White House twice in July 2010. As a UCLA student, Lekovic served as an editor of a Muslim magazine called Al-Talib, which in 1999 ran an editorial calling Osama bin Laden "a great mujahid" and saying when bin Laden is called a terrorist, "we should defend our brother and refer to him as a freedom fighter, someone who has forsaken wealth and power to fight in Allah's cause and speak out against oppressors. We take these stances only to please Allah." That issue identified Lekovic as a managing editor. Like CAIR, MPAC also has pushed that "war on Islam" message. MPAC defended Hizballah's 1983 attack on a U.S. Marine barracks in Lebanon which killed 241 Americans and questioned U.S.-terror designations for Palestinian terrorist groups Hamas and Palestinian Islamic Jihad. On July 18, 2011, White House Senior Director for Global Engagement QuintanWiktorowicz hosted four MPAC officials for a private meeting. Two weeks later, the White House issued "Empowering Local Partners to Prevent Violent Extremism in the United States," a counter-terrorism initiative which made no mention of radical Islam or jihad waged by its followers. Rather, it named only al-Qaida as the enemy and included a vow to counter al-Qaida's narrative that America is at war with Islam. That focus fits neatly with MPAC's agenda. It has lobbied for years to strip references to Islam from national security dialogue, even though terrorists from al-Qaida to Hamas use Quranic doctrine to justify their bloody campaigns. And it marks the culmination of a dream described by MPAC founder Salam al-Marayati in a 2005 speech: "Counter-terrorism and counter-violence should be defined by us," he said. "We should define how an effective counter-terrorism policy should be pursued in this country. So, number one, we reject any effort, notion, suggestion that Muslims should start spying on one another ... That is why we are saying have them [law enforcement] come in community forums, in open-dialogues, so they come through the front door and you prevent them having to come from the back door." Wiktorowicz, a member of President Obama's National Security Council who authored a 2005 ebook on radical Islam, was a receptive host for MPAC government and policy analyst Alejandro Beutel, Washington, D.C. office director Haris Tarin, policy analyst Hoda Elshishtawy and Shammas Malik, an MPAC intern, White House logs show. MPAC didn't tout the July 18 meeting publicly but quickly praised the White House initiative. It "echoes MPAC's long-standing position of emphasizing community-based solutions in addressing violent extremism," the organization said in an August 3, 2011 news release. The MPAC report questions the Obama administration's integrity by suggesting that the "U.S. is so out of step with global public opinion" on this issue because it is unduly influenced by "domestic political consequences" and campaign concerns, an allusion to the perceived political power of the pro-Israel lobby in the U.S., which MPAC often invokes. Despite MPAC's strident public opposition to U.S. policy, Wiktorowicz again hosted Beutel, Tarin, and Elshishtawy on November 4, 2011  just a month before a follow-up counter-terrorism document was released. It spoke to a lot of the feelings that I think many Muslim Americans have with respect to their position here in America post-9/11. We are loyal citizens to this nation and we are trying to do everything we can to keep it safe and secure. And yet even when we're doing the right things and in many cases, laying our lives down on the line for our nation, we still get stigmatized sometimes. Most recently, Beutel co-authored an op-ed with Tarin, in which the two MPAC officials criticized NYPD surveillance of Muslim student groups across the Northeast: "The NYPD's surveillance of an entire community based on their faith — with no evidence of criminal activity — is a blow [to] democracy and an ineffective and counterproductive offense to its mandate to 'protect and serve.'" In September 2010, Beutel criticized FBI raids in Chicago and Minneapolis targeting supporters of the Popular Front for the Liberation of Palestine (PFLP) and the Revolutionary Armed Forces of Colombia (FARC), both U.S.-designated terrorist organizations. Beutel argued that "[t]he FBI cannot continue to tell the American people that harassing anti-war activists falls under the rubric of counterterrorism and a fight against al-Qaeda ... They have absolutely nothing to do with each other. The FBI is undermining the trust that has been built between communities and law enforcement." Farhana Khera  executive director of Muslim Advocates and the National Association of Muslim Lawyers (NAML). She casts FBI counter-terror stings as "entrapment." Following arrests in late 2010, she told USA Today, "But for the government's role in these cases the suspects may have been left with their own bravado. Law enforcement resources need to be focused on actual threats." Khera also has compromised FBI operations and coached mosque personnel on how to evade FBI surveillance. "In one case, the FBI even wanted to build a gym to attract young Muslims to work out and 'discuss jihad," Khera once wrote. In July 2010 Khera told delegates at an Islamic Society of North American convention: "Sometimes [Muslim] community members don't even think of themselves as a[n] [FBI] source. They might just think [to] themselves, 'Well, I have a good relationship with the head of the FBI office. He comes by my office from time to time and we have tea, or we go to lunch, and he just talks to me about the community.' But what may seem like an innocuous set of conversations in the FBI's mind they may be thinking of you as an informant, as a source. And the repercussions and the harm that that can cause can be pretty serious." Khera shows up three times in the White House visitor logs, most recently in August 2011. Hisham al-Talib  A founder and current VP of Finance for Herndon, VA-based, International Institute of Islamic Thought (IIIT), an organization the FBI believes has housed key Muslim Brotherhood leaders in the United States since the late 1980s. Al-Talib was among seven people to meet March 30, 2012 with Joshua DuBois, White House executive director of the Office of Faith-based and Neighborhood Partnerships. A 1987 FBI investigative report, obtained via a Freedom of Information Act request, cited a source whose name was redacted but who has private communication with IIIT leaders. Their conversations show the IIIT leaders "...are implementing Phase I of the overall six phase IKWAN [Brotherhood] plan to institute the Islamic Revolution in the United States." The source said that IIIT leaders were working "to peacefully get inside the United States Government and also American universities" ultimately to help overthrow non-Islamic governments. Just four years later, the IIIT acknowledged funding WISE, a Tampa think-tank that housed four members of the Palestinian Islamic Jihad's governing board (Sami al-Arian, Ramadan Shallah, Basheer Nafi and Mazen al-Najjar). WISE had a cooperative agreement to work with University of South Florida faculty. In a November 1992 letter to al-Arian, IIIT President Taha Jaber al-Awani explained the intimate relationship between the Tampa and Virginia operations. "And I would like to affirm these feelings to you directly on my behalf and on the behalf of all my brothers [naming IIIT officials including al-Talib] ... "that when we make a commitment to you or try to offer, we do it for you as a group, regardless of the party or façade you use the donation for ... [W]e consider you as a group ... a part of us and an extension of us. Also, we are part of you and an extension of you," al-Awani wrote. "[O]ur relationship, in addition to being a brotherhood of faith and Islam, is an ideological and cultural concordance with mutual objectives." The letter named the IIIT officials who shared this view, including al-Talib. Imam Talib El-Hajj Abdur Rashid  religious and spiritual leader of Harlem's Mosque of the Islamic Brotherhood. Rashid rationalized Iranian President Mahmoud Ahmadinejad's stance on destroying Israel, saying it merely is a "sentiment born of the legitimate anger, frustration, and bitterness that is felt in many [parts of the Muslim World" because of Israel's "ongoing injustice toward the Palestinian people." He also serves on the National Committee to Free Imam Jamil Abdullah al-Amin. Al-Amin, formerly known as H. Rapp Brown, was convicted of killing a Georgia police officer in 2002.White House logs place Rashid in two meetings during 2010 including a July 13 event with President Obama. Hatem Abudayyeh  executive director of the Chicago-based Arab American Action Network, founded by Rashid Khalidi, a friend of President Obama. Abudayyeh has been under criminal investigation at least since September 2010, when FBI agents raided his home and office in connection with a terror-support probe. In a 2006 interview, Abudayyeh blasted Israel's "military killing machine" after Israel retaliated for a cross-border Hizballah attack that killed five people and led to the kidnapping of two soldiers. "The U.S. and Israel will continue to describe Hamas, Hezbollah and the other Palestinian and Lebanese resistance organizations as 'terrorists,'" he said,"but the real terrorists are the governments and military forces of the U.S. and Israel." He visited the White House in April 2010. Outreach to minority communities can foster a feeling of inclusiveness. However, President Obama opening the White House to radical Islamists compromises American security in at least two ways. First, it legitimizes groups and individuals whose track records beg skepticism and scrutiny. Second, White House visitor logs show that top U.S. policy-makers are soliciting and receiving advice from people who, at best, view the war on terrorism as an unchecked war on Muslims. These persons' perspectives and preferred policies handcuff law enforcement and weaken our resolve when it comes to confronting terrorism. This was an interesting comment from a reader, Frank Livingston. It is entitled, "Read our history with Shariah/Islamic law in 1786." I often hear those that do not know America's history with Shariah/Islamic law say the reason why Muslims hate America is because we occupy the Middle East however, how would they explain this? I suggest you read the entire letter and keep asking yourself questions about what happened in 1786 (before this nation was formed) and what is happening now. Are we experiencing the development of a worldwide Caliphate mentioned by the Tripoli ambassador? Is Pres. Obama helping the Muslim Brotherhood form a global Caliphate so when he leaves as president of the United States and is the UN Secretary-General he can rule the world dominated by Shariah? If not, why is he and his staff pushing the YouTube video as the reason to the murder of four Americans in Libya? It looks to me this is his goal. Why doesn't the Democratic Party take action? Why isn't the RINO leadership of the Republican Party trying to stop the development of a global Caliphate? These answers rest and more rest in what was called Cultural Marxism in 1923 when the Marxist first developed the program in Germany however, being smart on delivering a message they changed the term to "political correctness" or just "PC" for short. We will not save this nation until we identify our true enemy and that is Cultural Marxism as it is the flying carpet in which the main players of the Democrat Party ride (communists, socialists, Marxists, Islamists, progressives, left-wing radicals, etc) and it is also the glue that bonds them in their quest to destroy America and the western world. Now we will get back to our history lesson with the 1786 letter. Steven Emerson, is an American journalist and author, who writes about national security, terrorism, and Islamic extremism. Emerson is the author of six books, and co-author of two more and a TV documentary, "Jihad in America." He is the Executive Director of the Investigative Project on Terrorism (IPT), a data-gathering center on Islamist groups. 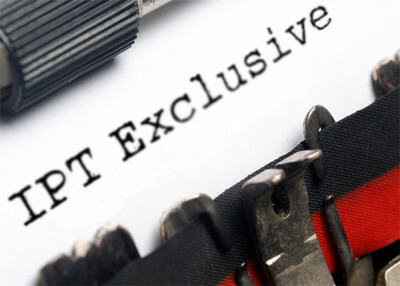 Jim Rossomando writes for the IPT.